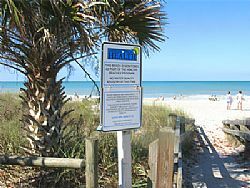 The U.S. Environmental Protection Agency proposes eliminating a beach water testing grant program nine months after Florida reduced testing at beaches as a result of state spending cuts. Beaches in 34 counties were tested for bacteria weekly by the Florida Department of Health beginning in 2002. But DOH scaled back the program in September after cutting $525,000 from the program budget in 2011-12. That left only a $530,000 annual federal grant for continued testing. Testing ended at beaches Citrus, Dixie, Levy and Taylor counties. Testing also was reduced to every other week at 24 counties while six counties continue to conduct weekly testing on their own.